A Motivational Blog about how to handle Life Situations in One's Life. A Blog about Religious Hindu Philosophy of Bhagwat Gita or Gita, Geeta. These are Teachings of 'Lord Krishna' given to 'Arjuna' on the battlefield of Kurukshetra during Mahabharata war, more than 5000 years before, in Haryana State of India. How these philosophies / teachings are still relevant in modern day to day life of today, shall be there in this blog. So Enjoy Divine words of God explained in this Blog. Just do a reality check in your daily day to day life. Check whether you remain stressful, tense, disturbed in mind or you remain calm, peaceful, happy in mind. If you remain stressful, tense, disturbed in mind then it shall lead to unhappiness while if you remain calm, peaceful in life then you shall be happy in life. We see this world through our mind so if our mind is peaceful; we enjoy the beauties of nature & love being born to enjoy this life. But if our mind remains tense, stressful, disturbed; life seems like a curse. We can never enjoy our life if our mind remains in a disturbed state of mind. So the key to happiness in life is that our mind remains calm & peaceful. To understand your state of mind, you should introspect & see what are the reasons that your mind becomes stressful, tense & disturbed. 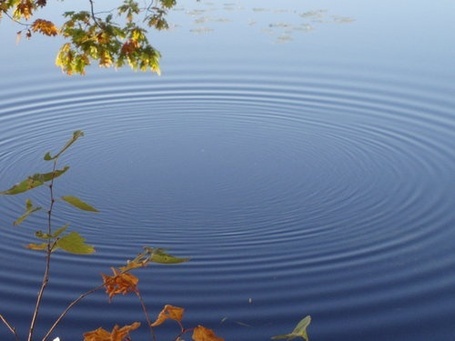 If you throw a small stone in the calm, peaceful pond of water then ripples are generated in the pond. If you try to stop those ripples with your hand or any other means, more & more ripples are generated. Same is the case with our mind. When our peaceful mind is disturbed due to any reason in our life then trying to undo that situation is very difficult. So we should try to analyze in our life, what was the reason that caused those ripples in the first place in your peaceful mind. Also, in future you should try to stop such situations in your life. The main reason why our mind remains disturbed is that we are not satisfied with our present state. If you have something, you are not happy with it. In your relations you may not have harmonious relations with your near & dear ones. If you have a particular amount of money with you, it seems less to you & you want more of it. Same is that, you have Greed for other things & don’t know how to enjoy the one’s you are already having. To be peaceful at mind, the first & foremost thing is to be satisfied with what you have at present & try to make harmonious relations with the people all around you. Once you are able to do that then you shall find that you are better off & much peaceful. Just try to appreciate the positive aspects in your life & avoid pondering over negatives in life & that shall make you more peaceful. Also try to control your desires as unfulfilled desires are the ones which keep our mind disturbed. "As the waters (of different rivers) enters the Great Ocean, which though full on all sides remains undisturbed, like wise a person who is not disturbed by the incessant flow of desires - can alone achieve peace, and not the man who runs after these desires & strives to satisfy such desires." Sri Krishna said to Arjuna: One who is situated in the Self (soul) and behaves same during happiness and distress; one who looks upon a lump of earth, a stone and a piece of gold with an equal eye; one who is equal toward the desirable and the undesirable; one who is situated equally well in praise and blame is the one who is of steady mind. Sri Krishna said to Arjuna: One who is steady in honor and dishonor; one who treats alike both friend and enemy; and who has renounced all material activities—such a person is said to have transcended the three modes of nature & lives in a peaceful state of mind. So if you want to have peace of mind in life, you need to be satisfied with what you have at present in life & should not hanker after those desirous objects which are beyond your reach. Just try to make harmonious relations with the people all around you & you shall feel peaceful & happy in life. Other than that turning your mind's attention towards God or Spiritual practices like listening to devotional songs (Bhazans), reading spiritual literature, chanting religious mantras, doing Yoga etc. shall also make your mind peaceful & the "Key to Happiness lies in a Peaceful Mind only". Meditation is one of the major keys to happiness. It builds a bubble around you which protects you from anxiety, negativity and other negative emotions. Go within to find your happiness. "Happiness lives in a quiet spot within you. You need only be still and silent and allow it to unfold until it eventually engulfs you." © GitaBlog.com All articles in this GitaBlog are subject to Copyright of the Author. All rights reserved. Copying / Reproduction of these in any form is Strictly Prohibited.